Since 1872, Ringling Bros. and Barnum & Bailey’s Circus has leveraged its slogan, “The Greatest Show on Earth” to international renown. But back in the early ‘60s, along came the state of Utah promoting its local ski industry with the slogan, “The Greatest Snow on Earth.” Learning of Utah’s application for a federal (nationwide) trademark in 1988, Ringling Bros. decided to challenge. In 1995, the U.S. Trademark Trial and Appeal Board approved Utah’s request to trademark the slogan, forcing Ringling Bros. to file suit in 1996. Ultimately, the U.S. District Court ruled in favor of Utah, stating Ringling Bros.—in addition to the fact that the two entities were in vastly different industries—had failed to prove that consumers were confused by the similarly-sounding slogans. End of story. The Steamboat ski area and the Steamboat Springs Winter Sports Club, the entity that coined the “Ski Town” positioning, are upset. Utah, argues Steamboat marketing chief Rob Perlman, is attempting to parlay the enormous recognition of Steamboat’s slogan to launch its own campaign. 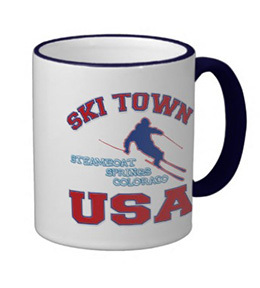 “We think it’s confusingly similar to our ‘Ski Town USA’ trademark, and they are attempting to leverage our brand and our brand equity.” (see full article in The Denver Post). Retorted the Utah Office of Tourism Managing Director, Vicki Varela, at the campaign launch, “It’s outrageous that [Utah] has the product and they have the brand.” I don’t suppose the fact that Salt Lake City owns one of the blandest cityscapes this side of Seoul, Korea, has anything to do with it. Well, as I’ve said before in previous blogs, I’m certainly no copyright attorney, but I’ve been around branding long enough to sense infringement when I smell it. Fundamentally, the law states infringement may occur where, in the same industry and/or in similar lines of business, there is likely cause for consumer confusion among competitors. Here we have the same industry, a similar neighborhood in the same geographic region, and essentially the same slogan (“City” and “Town” not being distinctly dissimilar). A settlement has been reached and the Visit Salt Lake Convention Bureau has agreed to drop the “USA” from the name, going by “Ski City” instead. “Steamboat appreciates Visit Salt Lake’s willingness to revise their campaign in order to address the concerns that resulted in a court filing,” explained Steamboat’s SVP of sales and marketing, Rob Perlman.